Hammocks Hammocks The hammock is a fabric sling used for sleeping or resting. It consists of cloth or a network of twine or thin natural or synthetic rope which is stretched between two firm points such as trees or attached to a metal or wood structure. Hammocks are widely used for relaxation in backyards, cottages, and waterfront areas, and they are carried as a lightweight type of bed on camping trips. They are also used for sleeping on ships and spacecraft. History The hammock was developed in Pre-Columbian Latin America and continues to be produced widely throughout the region, including among the Urarina of the Peruvian Amazon. Though it is unknown who invented the hammock, many maintain that it was a device created out of tradition and need. 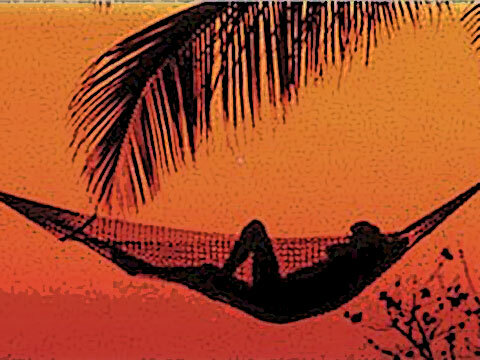 The English language derivation of hammock and various European equivalents is borrowed from the Spanish hamaca or hamac around 1700, in turn taken from a TaÃ­no culture Arawakan word (Haiti) meaning "fish net." HammocksHammocks were first introduced in Europe by Christopher Columbus when he brought many hammocks back to Spain from islands in the present day Bahamas. One of the reasons that hammocks grew in popularity in the New World was because of their ability to provide safety. By being suspended, sleepers were better protected from snakes and other harmful creatures. It also allowed people to avoid water, dirt, and other unsanitary conditions that existed in the early New World. They were not part of Classic era Maya civilization; they were said to have arrived in the YucatÃ¡n from the Caribbean fewer than two centuries before the Spanish conquest. They are made of various materials (including palm-based in western Amazonia), and the quality depends greatly on the thread and the number of threads used. In Mexico, hammocks are made in villages surrounding the capital city of the YucatÃ¡n, MÃ©rida, and are sold throughout the world as well as locally. Mayan hammocks are made on a loom and are hand woven by men, women and children. Hammocks are so symbolically and culturally important for the Yucatecans that even the most humble of homes have hammock hooks in the walls; in rural El Salvador, a family home may have multiple hammocks strung across the main room, for use as seating, as beds, or as sleep-swings for infants. The earliest hammocks were woven out of bark from a Hamack tree, and later this material was replaced by Sisal plant because it was more abundant. Current use Self-supporting hammock in a residential backyard Crocheted hammock Nylon hammock in a residential backyard. Example of a person lying diagonally in a nylon hammock.There are currently a wide variety of hammocks available. There are hammocks that are designed specifically for backpacking and include mosquito netting along with pockets for nighttime storage. There are hammocks made out of thin and lightweight material which makes them ideal for taking on daytrips. Other hammocks include self-standing metal or wood structures that support the hammock. Although they are usually bought premade, it is also possible to make your own hammock. Styles Current popular hammock styles include Spreader-bar, Mayan, Brazilian, Nicaraguan, and Travel / Camping Hammocks. Each styles is distinctive and has its own set of advantages and disadvantages. Many hammocks come in a variety of colors, patterns, and sizes ranging from a one person (250 - 350 lbs) to two or three person (400 lbs - 600lbs). Common dimensions for hammocks fall in a range between 11' to 14' across and 6' to 11' wide. The spreader bar hammock is easily recognized by wooden or metal bars at the head and foot of the hammock, spreading its width and allowing for easy access. This style is generally considered less stable and less comfortable for sleeping than other styles. The Mayan, Brazilian, Nicaraguan, and Travel / Camping styles are similar in form, but differ by material and construction. The Mayan and Nicaraguan hammocks are made from either cotton or nylon string that are woven to form a supportive net. Mayan hammocks have a looser weave than Nicaraguan hammocks, and the supportiveness of the hammock â€œbedâ€ depends on the number of strings and quality of the weave. Brazilian hammocks are made from cotton fabric and usually more durable than the string varieties. While Mayan and Nicaraguan hammocks are considered by some to have the potential to be more comfortable, Brazilian hammockâ€™s comfort is less dependant on its construction and therefore less likely to vary as highly from manufacturer to manufacture. Travel / Camping, or â€œParachuteâ€ hammocks are popular among Leave No Trace and Ultra Light campers and hikers for their reduced impact on the environment and their lightness and lack of bulk compared to tents. They are made of sturdy nylon fabric and may sometimes include a mosquito net and storage pockets. Some types offer a ridgeline to make set up easier, and may also include a slit for entry through the bottom of the hammock. Special ropes or cords are used to loop around trees in order to create attach points for the hammock Set-up / Use For the non Spreader-bar styles, the way in which they are hung is critical for comfort. Generally, a higher attach point is preferred as well as sufficient length between points, though these two dimensions can be adjusted to compensate for a lack in one or the other. The optimal angle of the attaching lies to the post / wall / tree is usually about 30 degrees. Though one can lie in a hammock lengthwise or across its width, the most recommended position is diagonally as it provides the most room and support. Users with back and joint pains often report some relief from these problems when sleeping in a hammock in this manner. Ships US Navy sailors relaxing and sleeping in hammocks Relaxing on a yacht in a nylon hammockHammocks have also traditionally been used by sailors on commercial sailing ships and naval vessels. A hammock moves in concert with the motion of the vessel, so the sleeper is not at a risk of being thrown onto the floor during swells or rough seas. Prior to this, sailors would often get injured and sometimes even killed as they fell off of their beds. As well, hammocks do not take up as much space in the vessel as bunks. The sides of traditional hammocks wrap around the sleeper like a cocoon and make an inadvertent fall virtually impossible. Also, many sailors became so accustomed to this way of sleeping that they brought their hammocks ashore and they became an item of leisure. Space During the Apollo program, the Lunar Module was equipped with hammocks for the commander and lunar module pilot to sleep in between moonwalks. Burial Hammocks are very popular in the Brazilian northeast region, but not only as sleeping devices: in the poorest areas of the sertÃ£o, if there is not a cemetery in a settlement, hammocks may be used to carry the dead to a locale where there is one; also, they frequently serve as a low-cost alternative to coffins. This custom inspired Candido Portinari's 1944 painting Enterro na Rede ("burial in the hammock").